Reading through all the theme round topics offered for this year Analogue Hobbies Painting Challenge, I think the second round was the easiest for me to make a pick. 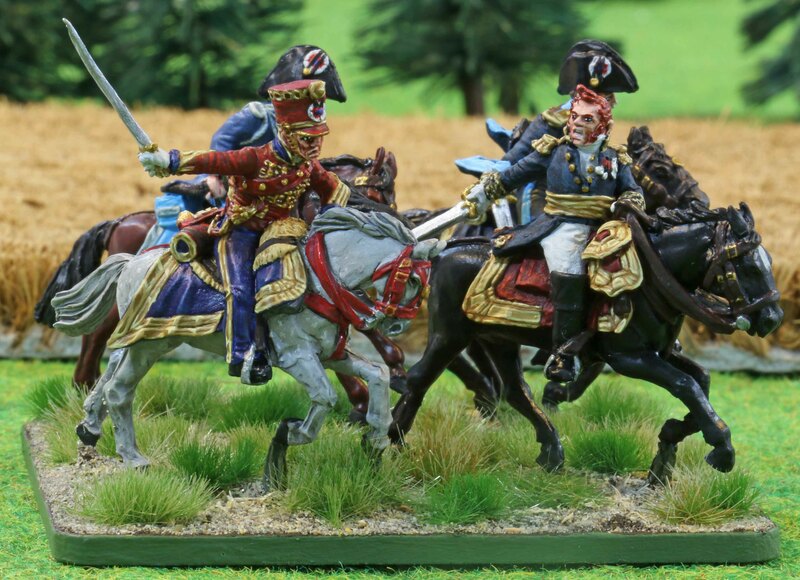 When I started painting napoleonics a couple of years ago, it be pace apparent to me that the one thing that would never be missing there was a wide range of spectacular cavalry and officers. 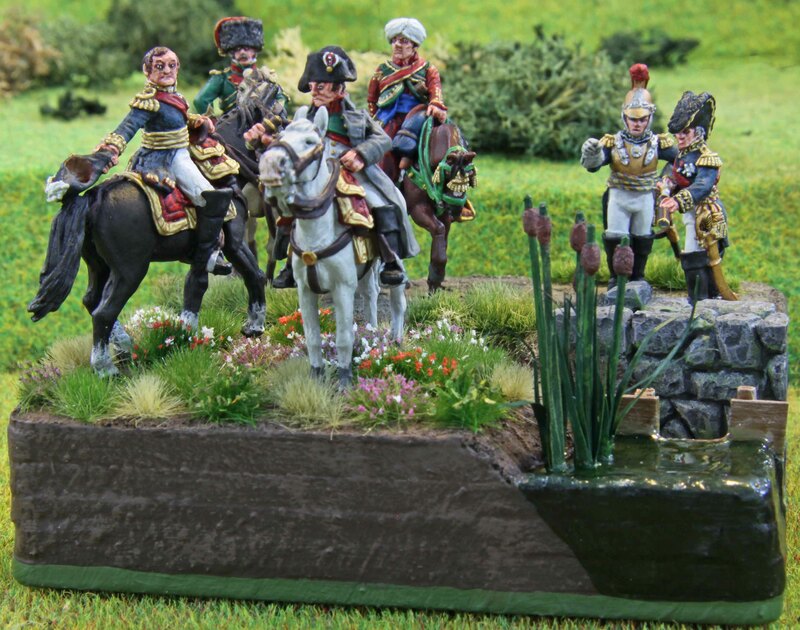 One of my favourite sets from the moment I saw it was Perry Miniatures rendition of Marechal Michel Ney based on the Waterloo panorama at Waterloo. What I really love about this set is all the dynamic and drive in the miniatures. 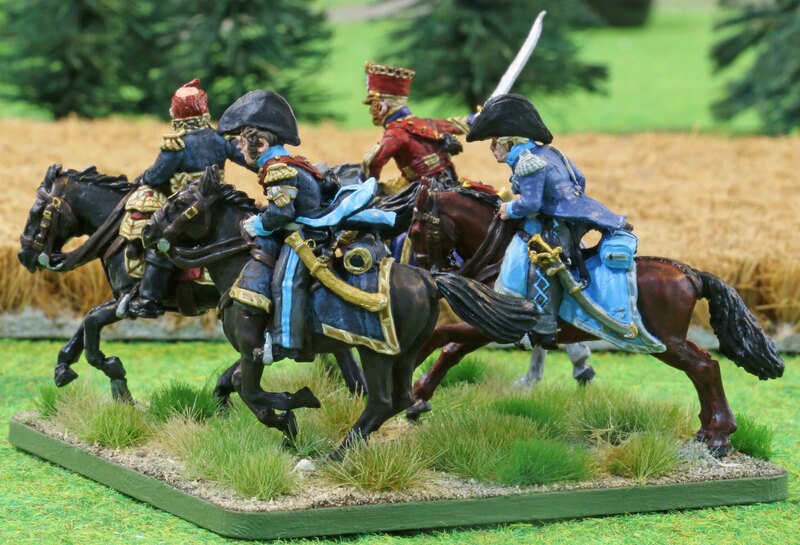 Most napoleonic higher command miniatures are quite regal, watching the action from afar, but these look like they are in the heat of it (like Ney and his ADCs were that day)! 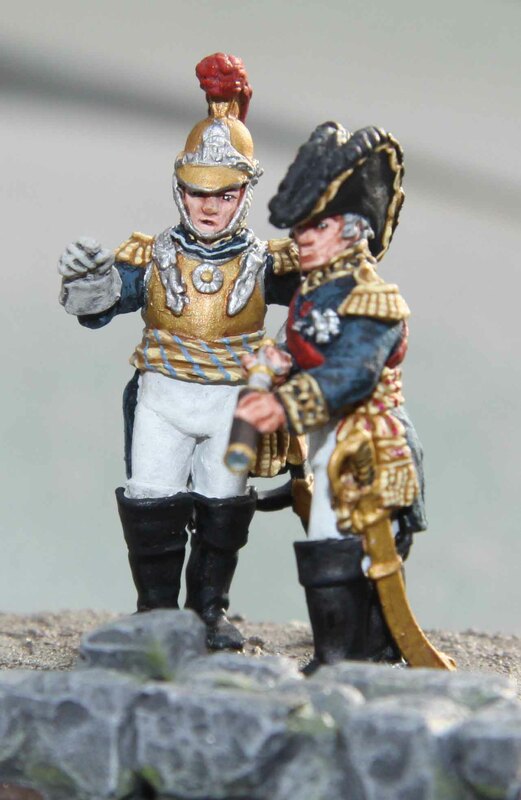 And the last thing that always appealed to me is, that they are French officers, so there are is lots of gold and silver fabric in their uniforms and saddlecloths and therefore lots of opportunities for NMM gold and silver, which I have really started to like since I started with Napoleonics! 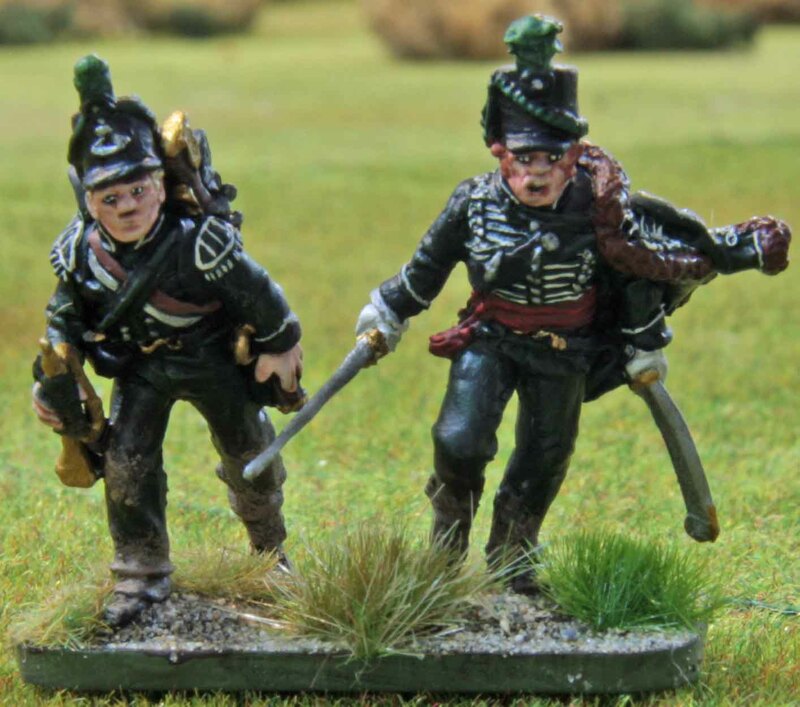 On a general note: in the past I have often had mixed feelings when it came to the Perry Miniatures casting quality. In this case I was really happy. Except for a bad mould line running over chef d’escadron Levavaseurs face, these minis were really perfect! But I felt there was something missing in the set. 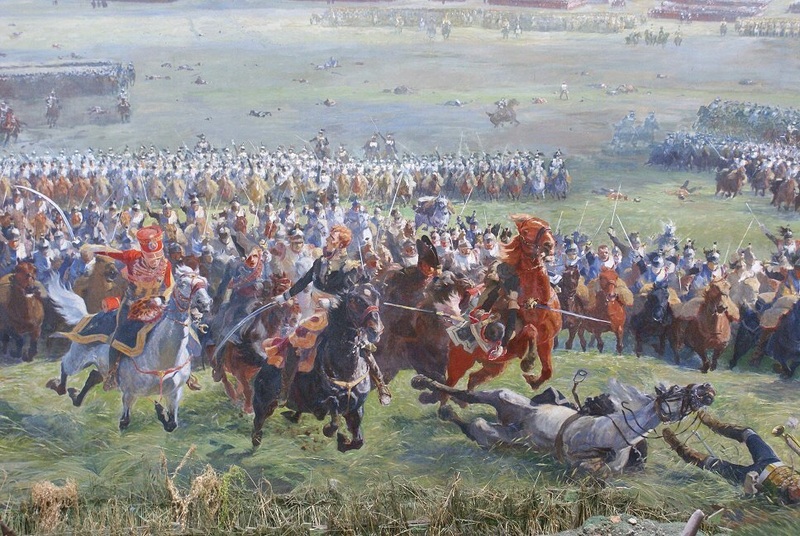 If you look at the painting itself, one can see, that there is not just Ney, Colonel Heymes and Levavasseur riding close together, but another officer, too (plus a Cuirassier being shot from his saddle, but there was not enough room on the base for him). It is hard to tell from the painting but his uniform looks lighter in colour, so I assumed it was not one of the other two Colonels acting as Neys ADCs that day, but possible someone of lower rank. So I chose a miniature from one of the Perry’s ADC sets and painted him up as an imperial orderly. I decided to keep very close to the painting itself while painting the minis. There are only two exceptions. Heymes horse is depicted as a white with dark grey socks. I personally wanted it to rather be a dappled horse and painted it up that way. The other exception is that I painted the leatherwork on Neys horse a dark brown instead of the red leather on the painting. At first I had gone for red, but it did not really look good with the mini and looked far too dandy for Ney. looking at Rousellot (Christmas present from my parents last year) he has him with brown leather work as well, so that seemed fine with me. Well, this is it. Hope you like the results of my work! This will be the last miniatures post for this year, but fear not, this is not the last you will hear from me this year! Now even though the title says that these minis are my 6th entry into the Painting Challenge, this is only half-true. 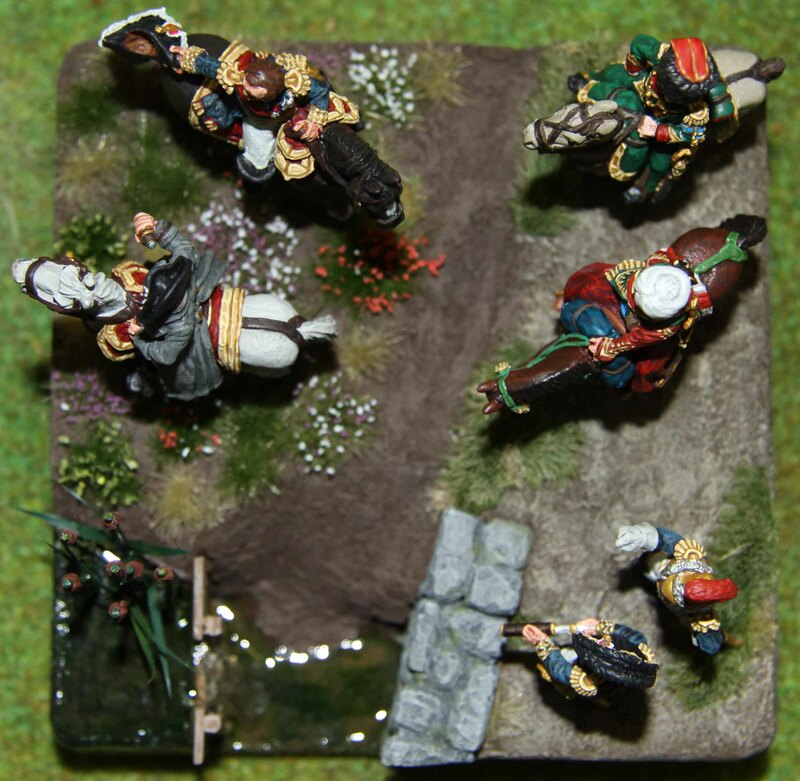 These are also my entry into the 3rd La Bricole Winter Painting Challenge with the fitting title “Deploy Skirmishers”. As the title suggests, this one is about light troops. I have to admit, that it caught me quiet of guard. Usually the La Bricole Challenges run for some time, but this one runs “only” for about a month and the first I heard about it, was when it started. 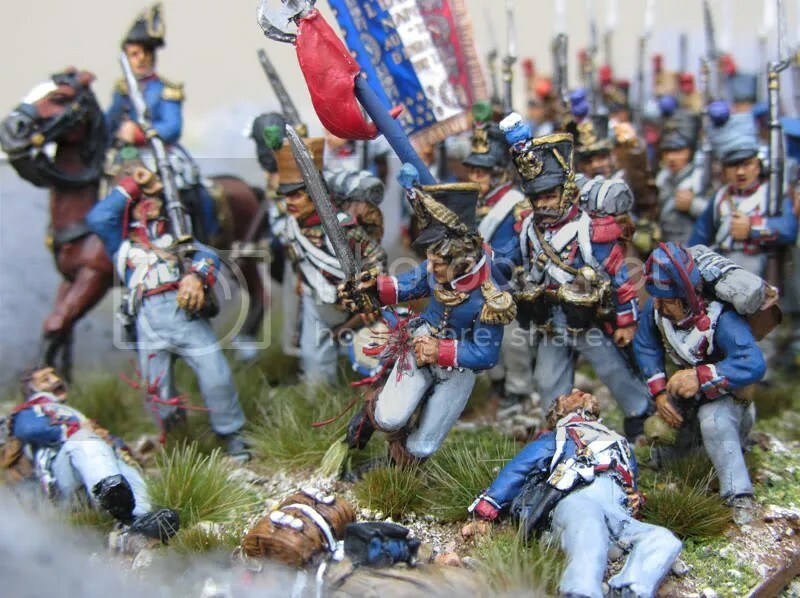 With the time taken by private matters (like looking for a new job) and the Analogue Hobbies Challenge I was sure I did not have the time to get the minis for a unit of my choice from storage and clean them up. 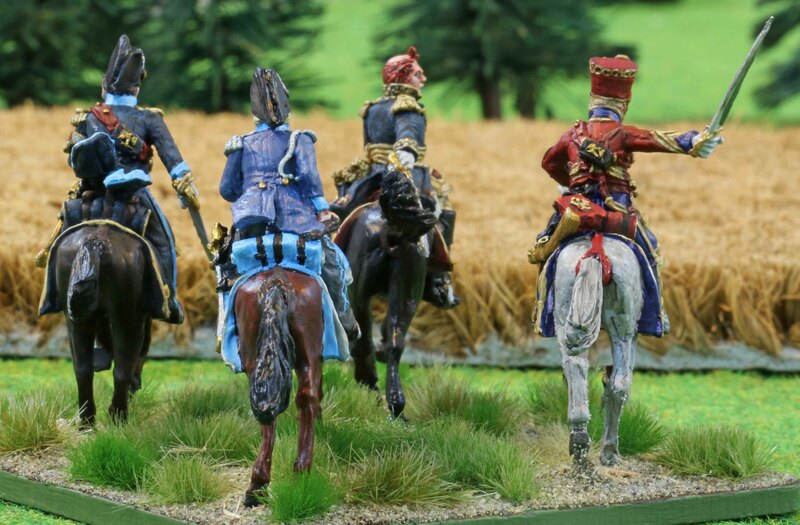 Luckily I had cleaned up and primed a bunch of 95th Rifles minis some years ago and had put them away, when I concentrated on my French and Prussians for Möckern. So I only had to glue them onto the film containers I use for painting and the party could begin. 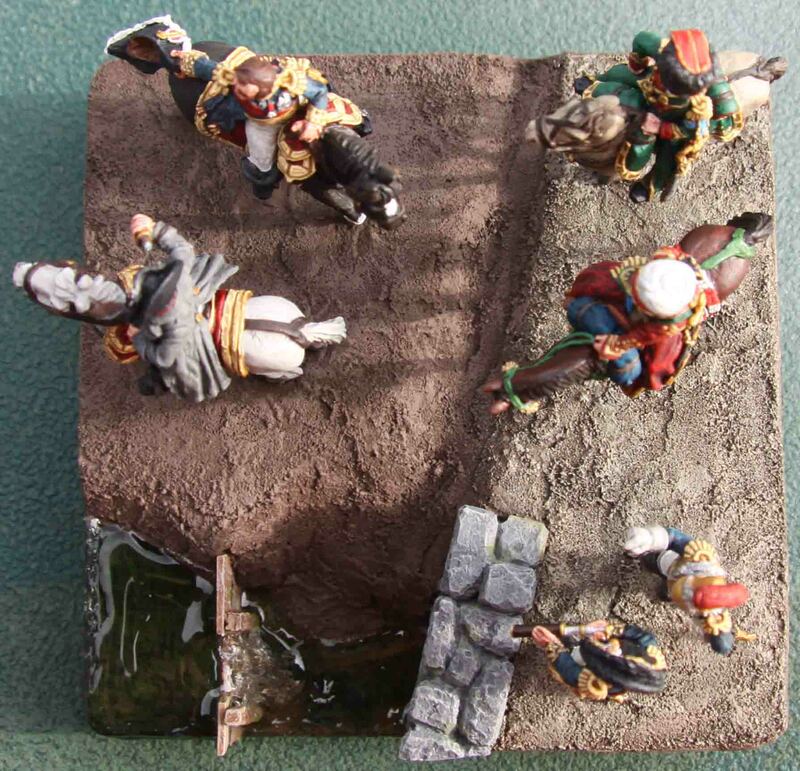 I had hoped that these would paint up a little faster and that I could paint an entry for the next fortnight theme (Hero or Heroic group) on the Analogue Hobbies Challenge at the same time, but some time last week it became clear that this was not going to happen. At the same time I was in no mood to halt work on these for something else. Thinking about the exploits of the 95th I was sure, that that could be passed as heroes. And it even got me thinking some more. Is not every soldier a hero in a sense. I mean it takes a good amount of courage to march out into a field to face thousands of other men who are there with the intention of ending your life. I think to do that takes courage and heroism. And since Curt allowed them to be entered, I can not be that wrong! Now on to the Rifles themselves. 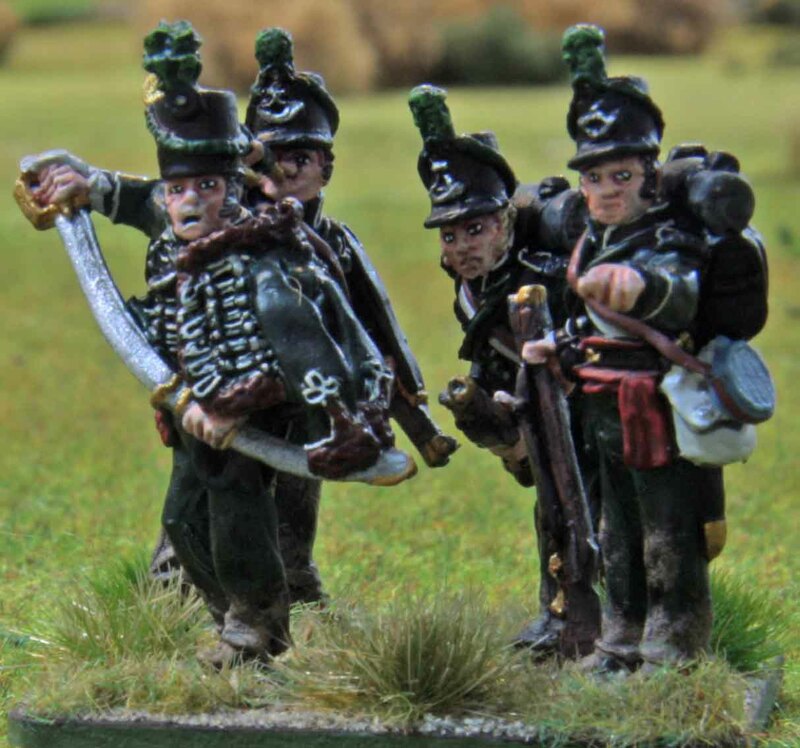 The unit was created in January 1800 as the “Experimental Corps of Riflemen” to provide sharpshooters, scouts and skirmishers. 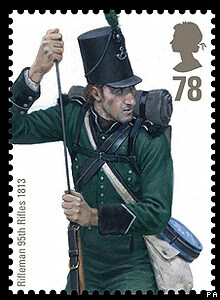 They were renamed the “95th Regiment of Foot (Rifles)” in 1803 (in between they were also renamed “The Rifle Corps”). In 1805 and 1806 they were sent to Germany to liberate Hannover from France. Five companies had a brief stint in South America where they were surrendered by their commanding officer, but after negotiations they were allowed to leave. At the same time the rest of the Regiment accompanied Athur Welsley (the later Duke Wellington) to Denmark. They were also send to Schweden, but never left their vessels. 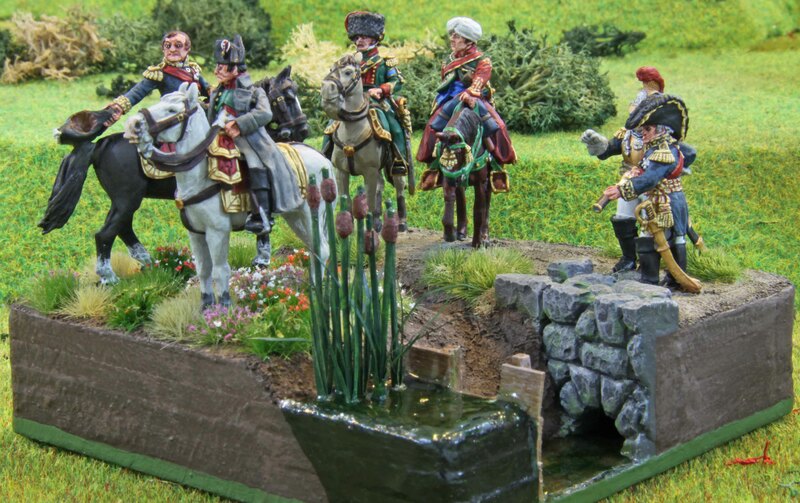 Their real rise to fame began during the Peninsular Campaign. Here they fought in every major engagement and served right from the landings at Mondego Bay till the advance into France. As part of the Light Brigade they were always in the thick of battle. One of their most heroic feats (here we come full circle with the fortnight theme) was the battle of Battle of San Marcial where a company under the command of Captain Daniel Cadoux held off an entire French division at Vera before withdrawing. They inflicted 231 casualties and suffering just 14 killed, unfortunately including Cadoux. After Napoleons first abdication, they returned to England for R&R and indeed many men who saw their enlistments end, left the regiment. 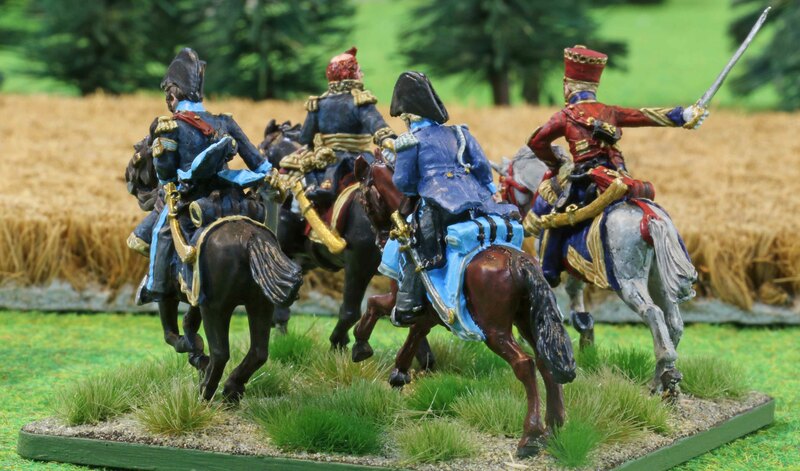 But with Napoleons return to power, many of them returned to the unit and the unit returned to Europe to fight again, seeing action at boy Quatre Bras and Waterloo. For those who want to get some idea of their exploits during the Napoleonic era (and not only from a TV series starring Sean Bean [I like him as an actor and always did, but I simply do not believe in Bernhard Cornwell or Hollywood teaching history]) there is a very good book by Mark Urban simply called “Rifles”. OK, enough of that and on to the minis, shall we! All of these minis are Perry Miniatures (two of them plastic, the other metal). 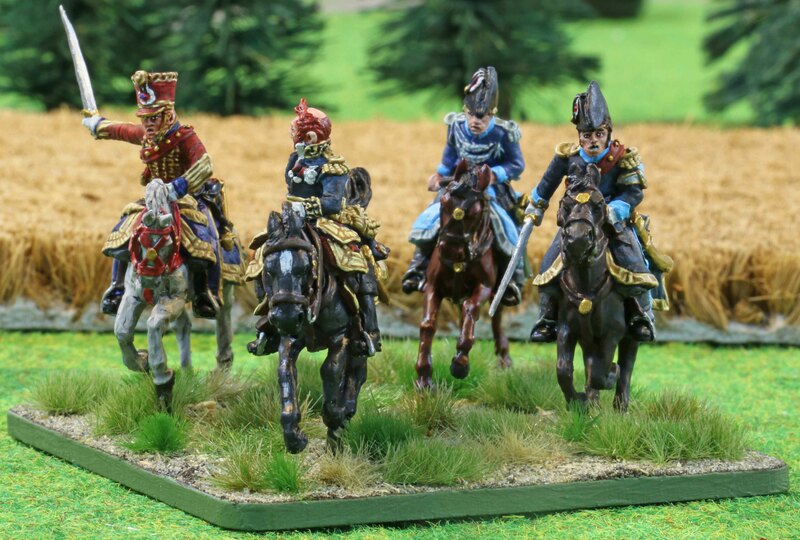 There is twenty of them in total, which under the Republic to Empire rules (1:20 ratio) will allow me to field them at full strength for Quatre Bras or if I remove a few minis, for Waterloo as well. 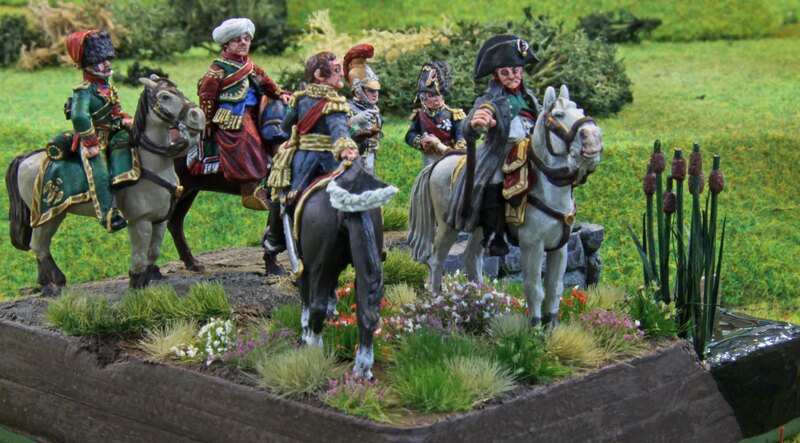 I did this with my Black Watch and I am going this with all my Napoleonic British, since I do not play the Peninsular and this will allow me to replay either battle. I have to say, they are some of the Perrys best minis, since each and every one has lots of character (often you only find that with the command packs or special packs). None the less the casting quality still was bad, as usual. I simply cannot understand how they can sculpt such nice minis and be so horrible on quality control. I know these came from one of the first batches, so they should have been good, but even though I took great care to clean them up, I still found some flash or chimneys where I did not expect them and had to remove them during painting. 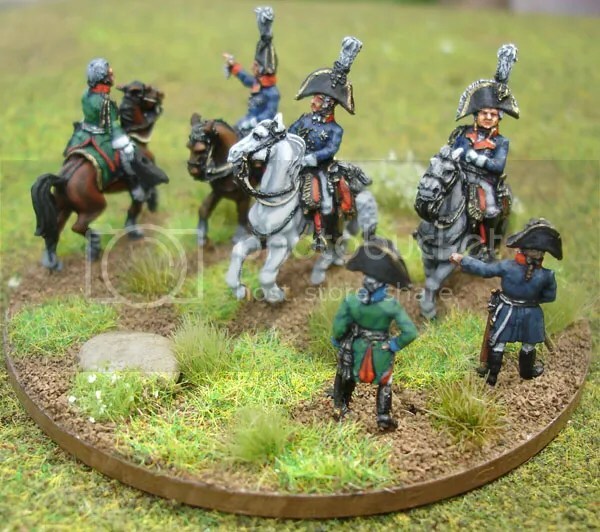 All in all I went and did a fast job on these to be able to finish them in time (and still had to pull a night shift on the last night), so they might now look as nice as my other Napoleonic minis. But before anyone asks… yes the numbers on the backpacks are freehand! Again they were based on half bases (except for the command stand) to allow me to use them in full skirmish deployment as well, just like what I described with my other light troops. For those of you wondering about the other entries, here is the link to the special page Curt set up for the first fortnight theme and for people to cast their votes for favourites. Up next we shall stay British, but this time we will be back in WWII. … pick up a few loose ends and make an apology! Overall I can not complain making both 2nd and third place on this one. And looking at the competition… this was not an easy one. I can only take my hat off to anyone else who took part. OK what else? 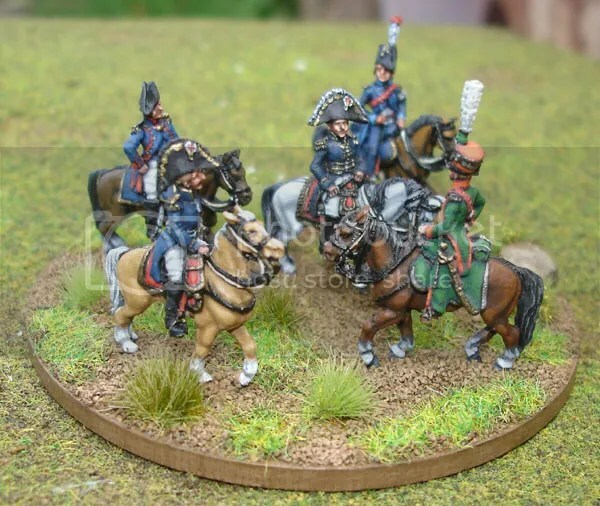 Ah yes… I finished the minis for the 12te Reserve Infanterie last month, but beleave it or not… I only manged to varnish them in the past four weeks. But I hope that I will be able to show them off soonish. Anything else… oh yes… my birthday. As you can see I am taking this chance to catch up on life a bit (and will in a few minutes go on renovating the kitchen which has already taken up the weekend 😦 ). But the good part are the presents. 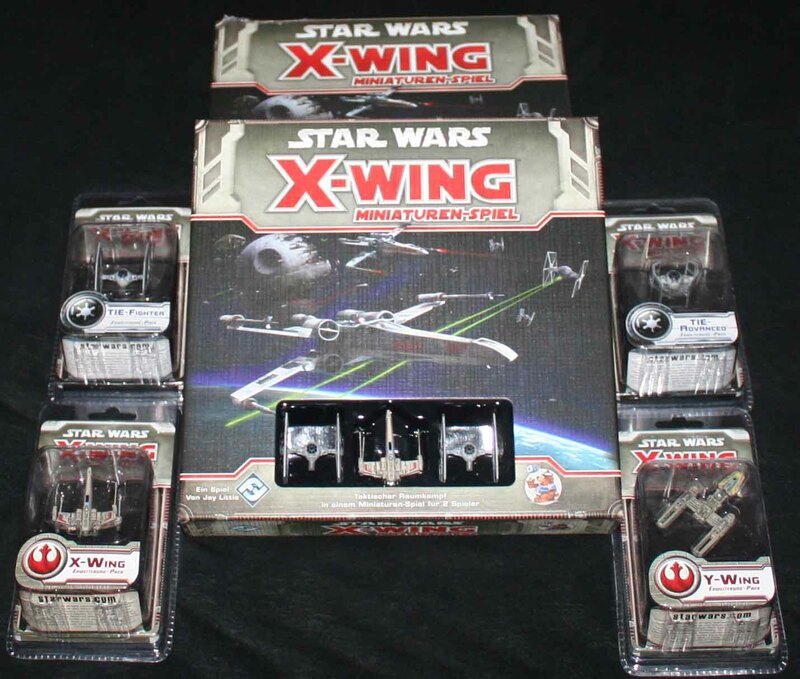 I made a sidenote to my better half the other week, that I am interested in the X-Wing tabletop game and she picked up on that and got me the basic game (twice) and the expansions for another X-Wing, another Tie-Fighter, a Y-Wing and a Tie Advanced. So with three X-Wings, a Y-Wing, five Tie-Fighters and a Tie-Advanced I should be able to play some serious space fights. Now I only need to get the new kitchen table or clear the clutter off my hobby table. Bless her… she always thinks of my wargaming needs! I hope you enjoy the finished product after going through all the paces with me! All pictures are also linked to larger versions if you are interested. Ok, so we are back from Scotland. First of all let me say we really enjoyed the holidays (except for one hotel in Oban). The people were great as was the land, too. We even had luck with the weather. Only rain for about 25% to 30% of the time and temperatures around 15°C. One day we even had strong winds on the Isle of Skye that drove the Midges away, which was a good thing since the Skye variety did not seem deterred by any of the five insect repellents we had taken along. Plus I was able to learn even more about Single Malt than I already did (yeah… you live, you learn). We even managed to climb Ben Lomond and Cruach Tairbeirt on the other side of the Loch (the later leaving our trekking boots with more water inside than outside). All in all I have to say that this holiday became more of a scouting mission than anything else. 1 1/2 weeks was just too little to see even the parts of Scotland we went to, but it gave us a good idea which areas to emphasise on our next trip. I will try to sort through the photos and post a few nice ones in the near future. Once the glue had dried I put filler around those two minis as well and painted the rest of the soil a dark brown. Everything was drybrushed a lighter brown and the road given a medium tan wash and drybrushed in beige to give it a slightly pebbled look. 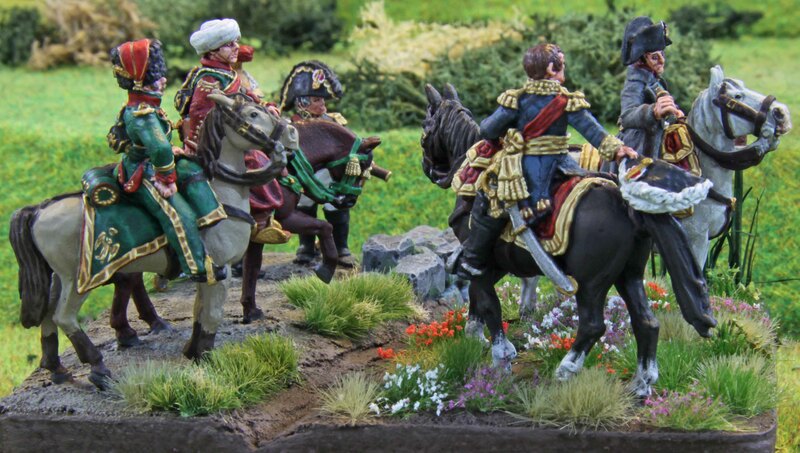 Also also painted the lenses of Napoleons and the Generals telescopes with high gloss varnish to make them pop. While you can not see it on the next photo I also repainted the edges of the base. I had painted all of the sides in the green I usually use for the edges of my bases, but did not like that. 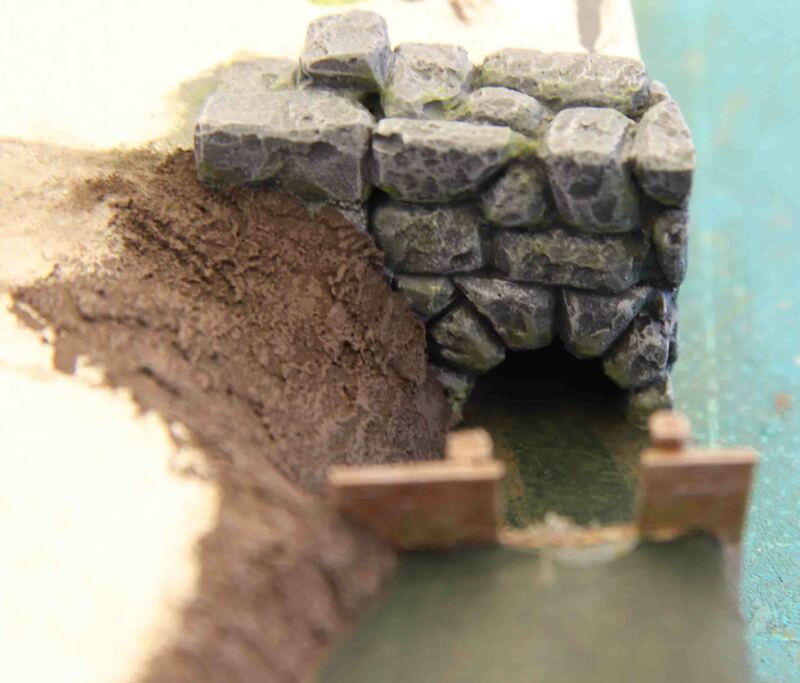 I only kept the green on the lower edge, to the hight of the original base and painted the rest in a soil brown or the dark green of the water to minic the terrain above. Really like that better now! This is where things will stand for some time now. 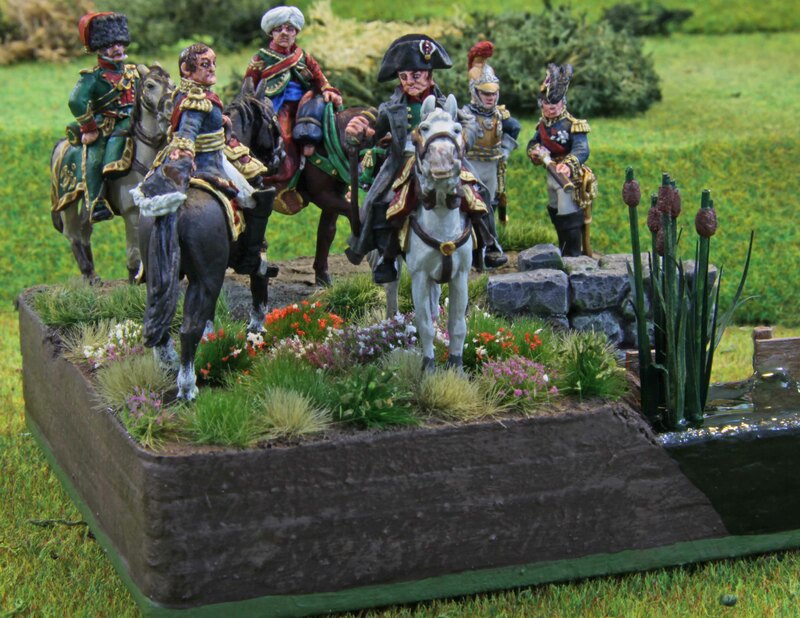 I have decided that I do not want just normal grass tuffs for the field Napoleon and Soult are standing on. My favourite dealer for these things tells me, that he should get the ones I want within the next two weeks. So fingers crossed they should be here before the deadline, if not I will have to go for the normal tuffs after all. 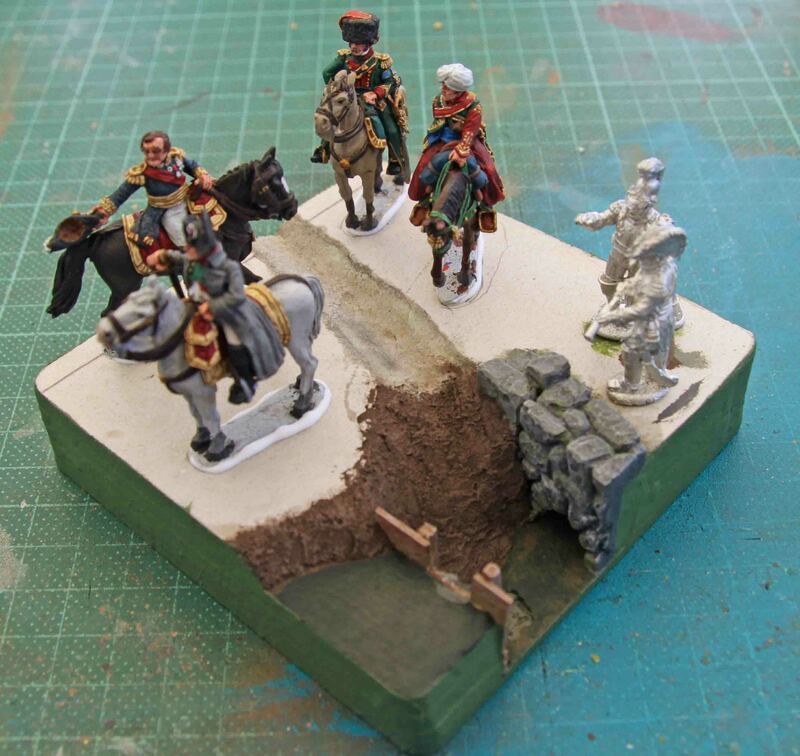 Ok a quick note before I am off on holiday… I managed to finish the two extra minis for the Napoleon base. A Carabinier officer and a General. Sorry for the sloppy photos, I had already packed the tri-pod away. Both minis were kept quiet simple. 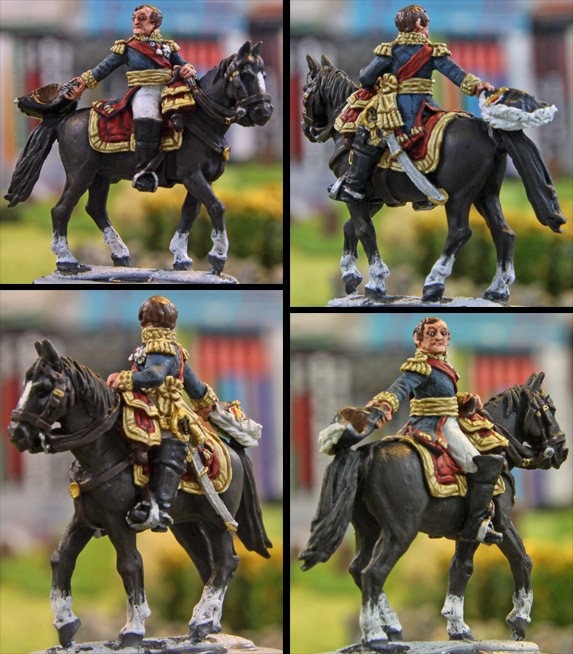 I painted the Maréchal / General mini up as a General. 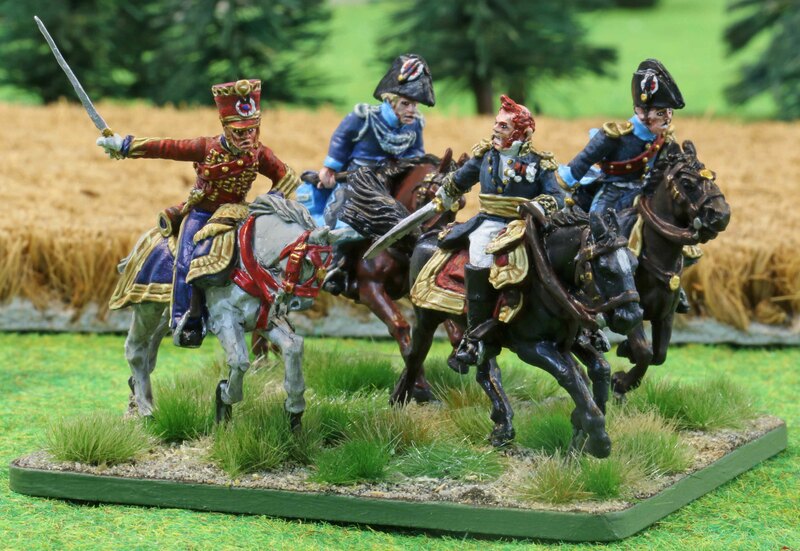 By the time of Waterloo Napoleon was short on Maréchals so I did not want another one besides Soult on the base. 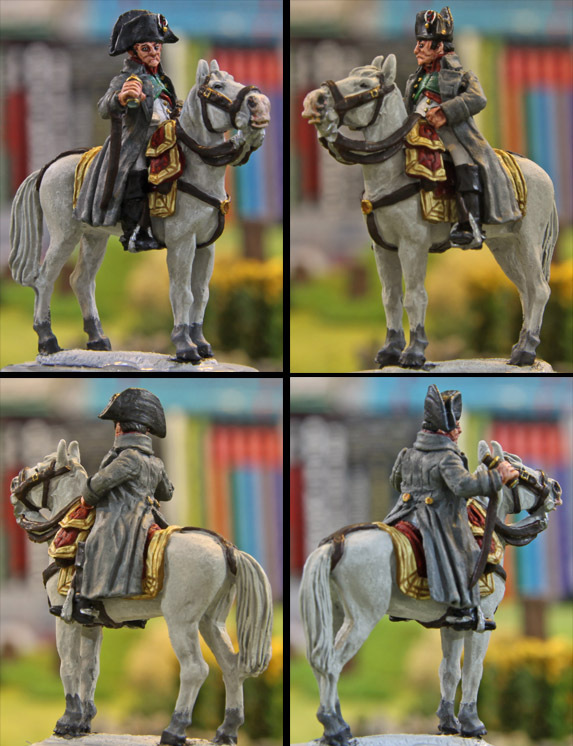 I also gave him a black crest to his bicorne to depict him as a staff general as opposed to a commanding general. The Carabinier officer gave me some headaches. They were supposed to wear their light blue uniforms on campaign. But while in the presence of the Emperor (as this one clearly is) they were supposed to wear their whites. No big problem. Except I got a feeling that all this white and polished plate would make him stand out on the base and I did not want that (see my notes about visual weight in the previous post). So I gave him a dark scabbard to break that up. Did not really break it up, but now that the minis are glued to the base, he does not really draw attention. Phew!!! As you can see I marked their positions with a pencil and also sketched some other terrain features. The white blocky thing in the front is a Hirst Arts block with a field stone arch. 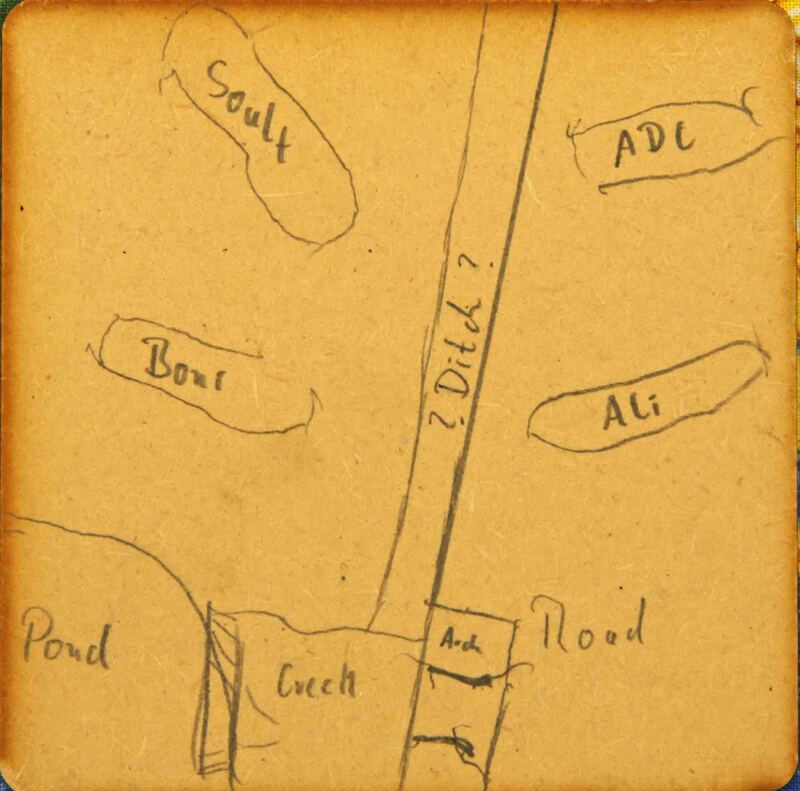 As you might be able to see from my notes, the base is also to feature a pond, small dam, creek and a road. The field stone arch will depict part of a small sewer under the road. Once the minis were removed I sketched the rest of the features onto the base. To look good the base needs three levels. The highest featuring the ground the minis are on, one slightly lower of the pond and ditch and the lowest for the creek. Now the difference between the medium and lowest level needs to be bigger to give the water gushing of the dam a nice look. 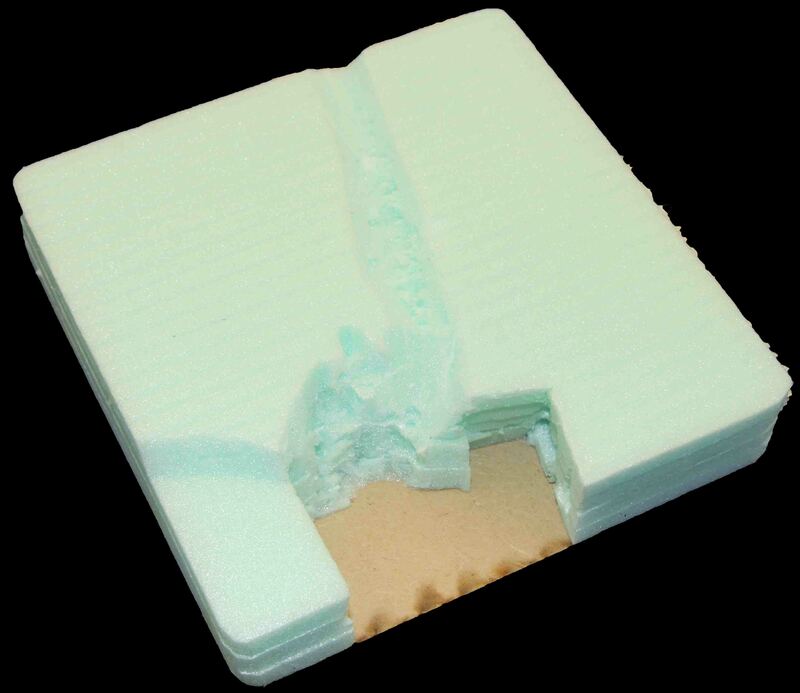 For this I use thin isolation foam usually use to sound proof laminate flooring. I used four layers of it and cut it into the shape of the base. For this I sandwiched them between two bases, fixed them and cut along the edges. Afterwards the markings I had made on the base at the beginning were transferred to the foam and the respective layers cut away. Especially along the creek this was a bit uneven, but it did not matter since this would be landscaped later on anyway. Now the layers were glued together and glued to a base (a new one, since I still wanted the one with my “notes”, in case I needed it later). I now painted the edge of the foam where the dam and the arch would be black. These spaces would be hard to reach with a brush once they had been glued into place. Since the foam is a bright green, it would have looked ugly if it shone through, so better now then later. I cut of the edge of the arch (since it runs diagonally to the edge of the base) and sanded it down. I also added another block to the top of it and this was cut and sanded as well. 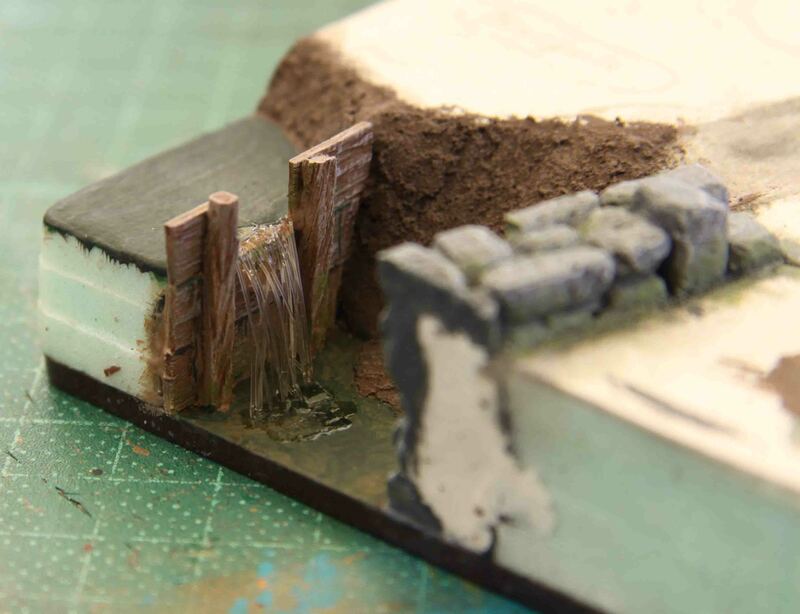 Another block from the mould for damaged walls to give it an uneven look would complete the stone work. The dam was build using a coffee stirrer and matchstick cut to size. All of this was now glued in place. At this point I got a sinking feeling that the base would be too soft. 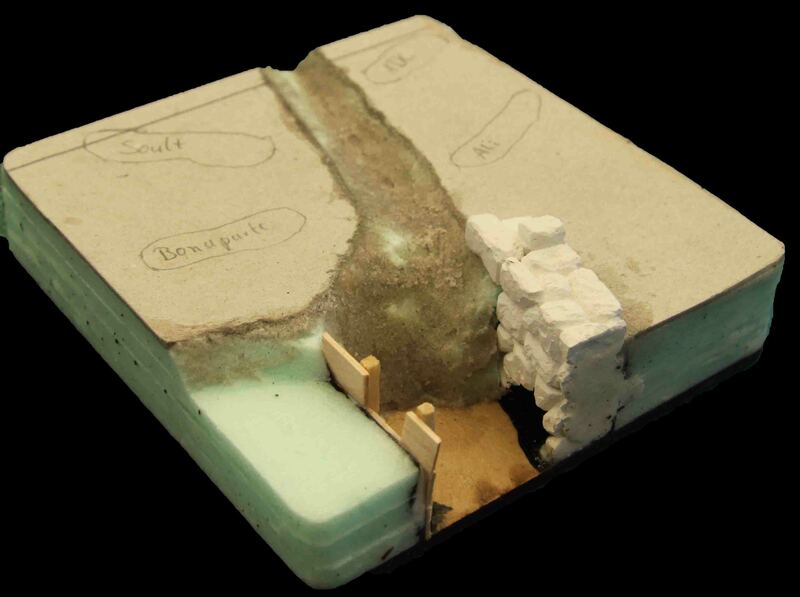 This insulation board is somewhat flexible with a very smooth surface. And I was afraid, that the minis would provide too much of a handle and break off during gameplay if mounted directly to the foam. So I cut some thick card to match the terrain and glued in on top the base, to create a sandwich and a stable ground for the minis. I filled the larger gash in the bank with plaster and covered the banks and ditch with wood filler for the final landscaping. Why wood filler? If you mix it with a little water you get a very fine grain structure, that can be painted over to depict soil. Since I want to build the water using modelling water I did not want any sand being poured onto the base after I did this, to make sure there would be no scratches. So I went for a material that would look the deal, but could be applied with a spatula. I also painted the edges of the base over with white glue to hide a pores in the foam and mask the layers somewhat once the edge of the base is painted. Up next came the first steps of painting. The “water” inside the pond and creek were painted in two shades of dark brown and washed with green to give a muddy look. The stones in three shades of grey and stippled with moss green to depict moss growing in the recesses between the stones. The dam was painted in faded browns and some dark greens (to depict algae growing on it of hanging down between the boards). Then I glued some fishing line from the top of the dam to the creek. This will later be covered with a water paste to depict the water gushing over the dam. Last the banks of the creek were painted as well. Now the edges of the base were painted olive-green to match the rest of my basing (although I am contemplating painting the upper parts brown since it is looking strange right now). The minis were glued to the base as well. Now I always knew that there would most likely be some space for other minis left on the base and this was the time check it out. On top of the road there was indeed some space. Either for a rider or two to three dismounted minis. I chose the latter. Why? Now a diorama (and command bases are more like a diorama than anything else) always looks best, if it is not too geometric. This is called visual weight. Some spots should draw the eye more than others without any looking bare. And it is best if not everything is orientated along an edge. For this reason the roads runs diagonally over the base and not parallel to an edge and the minis are looking towards a spot off centre. 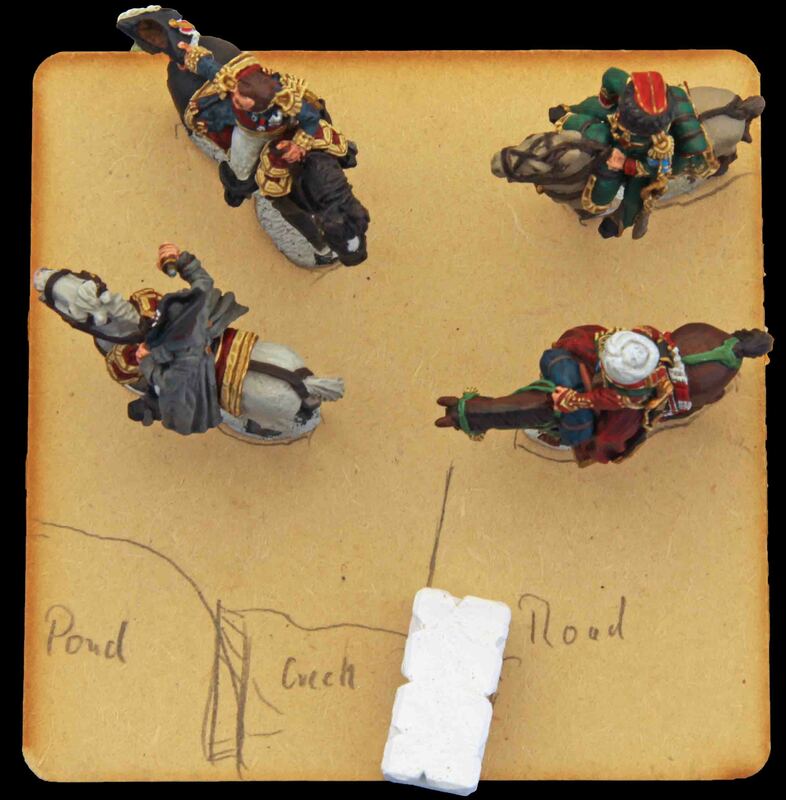 To achieve the weight, all the riders are on one side of the base, with the lesser characters (the ADC and Mameluke Ali) compressed into a corner, while the main characters (Bonaparte and Soult) have more space. 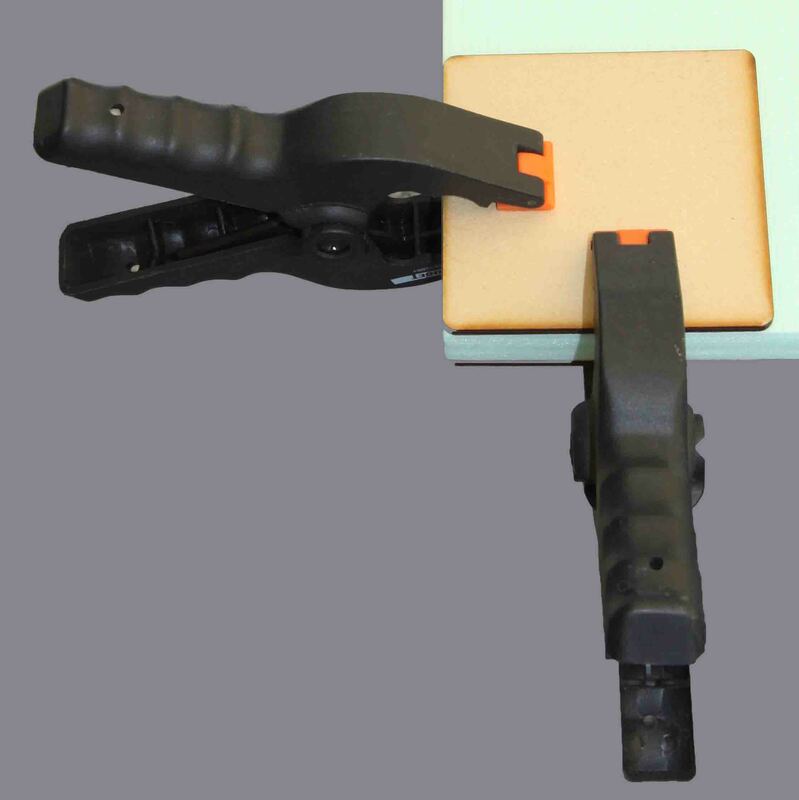 The dam and arch draw the eye, but their lower lever keeps the focus on the mounted characters. Now adding another mounted mini would have shifted the looks towards that side of the base and would have given more visual weight to the ADC and Ali. 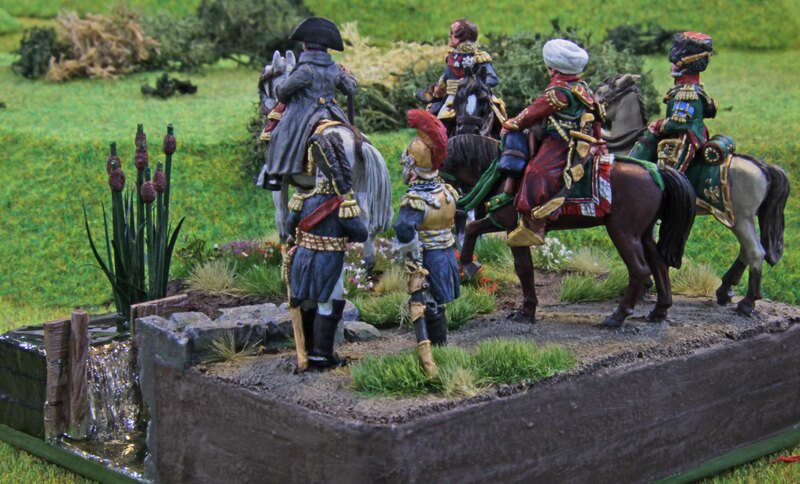 Two foot minis, with plainer uniforms look “lighter” on the other hand and do not draw as much attention. Also their lower hight creates a spiral on the base, going from the important characters, to the lesser ones, to the foot minis and down to the terrain on the lower level. I also picked only two minis since it looked too “heavy” when I put a third in the group. 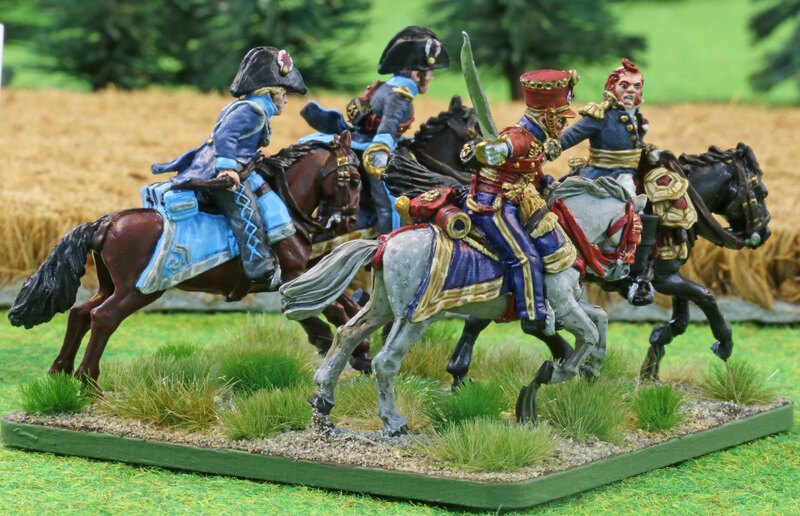 I picked another Maréchal / General and a Carabinier officer from Perry Miniatures for this and these shall be painted now. After the glue had dried, I filled the space between the integral bases of the minis and down the road with more filler, leaving the spot where the minis on foot will be bare. I also applied the water paste to the fishing line yesterday and poured some water into the pond and creek. I took no photos of that yet, since I did not want to move the base before the water had settled, so you will see those in the next installment. I do not know, when that will be though. 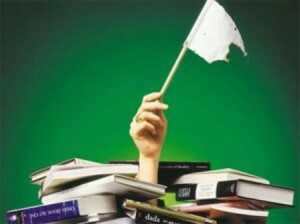 I will be away till early September and I am not sure yet, if I will get any work done until I leave. So keep your eyes peeled! The one thing that gave me a little headache from the beginning was his horse. 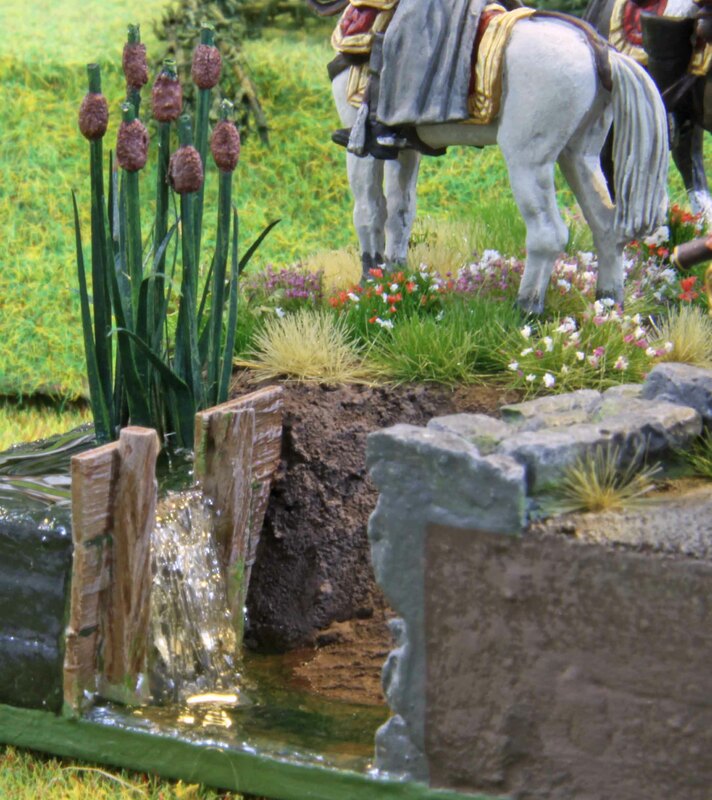 It is a well-known fact, that he rode a white horse at Waterloo named Désirée. But there is a huge variance in the hide of white and grey horses. 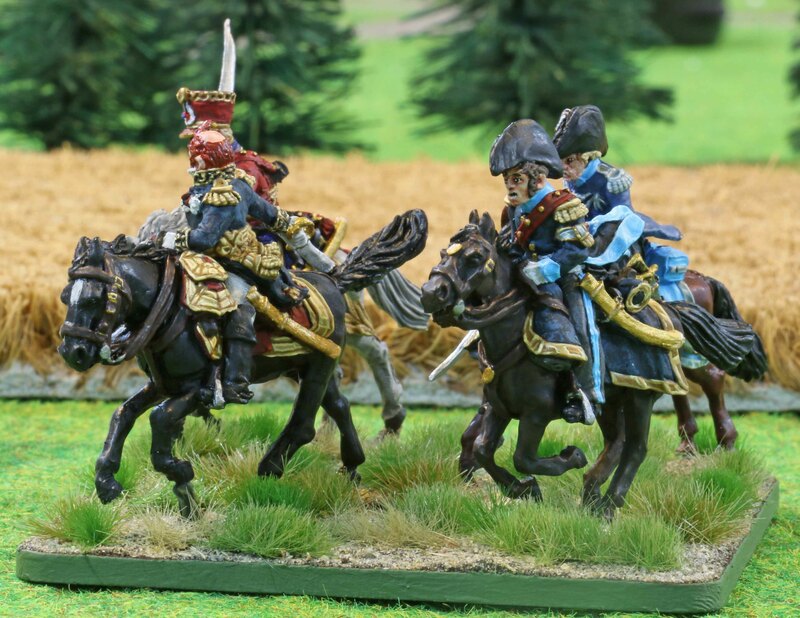 Paintings themselves are no real help either, since Napoleon had over 150 horses, many of them white, so one can not be sure, that if you find a painting of him on a white horse at Waterloo, it actually shows the right one. Many of the painting actually seem to show Le Vizir, most likely because his pattern is the easiest to find out (he was stuffed and is still on display at the Musee d’Armee de l’Hotel des Invalides in Paris). In the end I decided to just go with a pure white horse with grey socks and muzzle. Looking at photos from Le Vizir one can clearly see that he had a branding on his left hind leg. 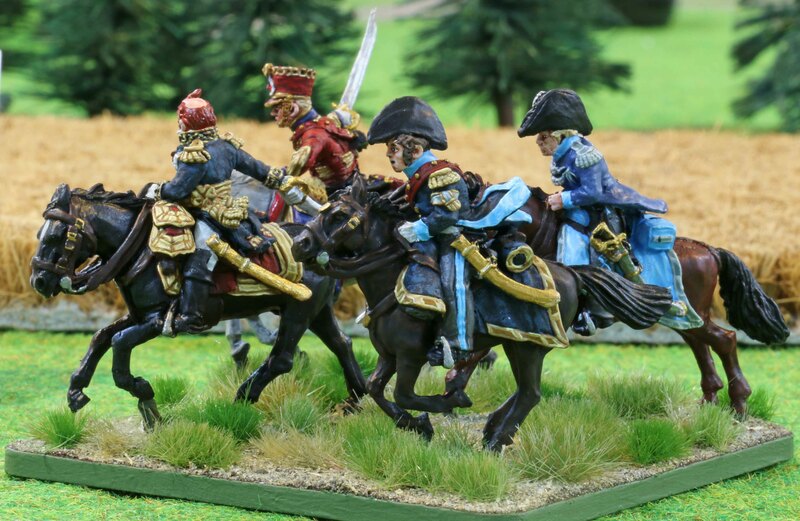 I am wondering if Napoleon had all his horses branded and if I should add a branding to this one as well. What do you think? Otherwise the paint job was quiet straightforward. Looking at the photos now, I realize that I still need to touch up the cockade on his hat but otherwise he is done. So now comes the hard part. I have a vision in my mind when it comes to his base, which will be a little more extraordinary than usual. 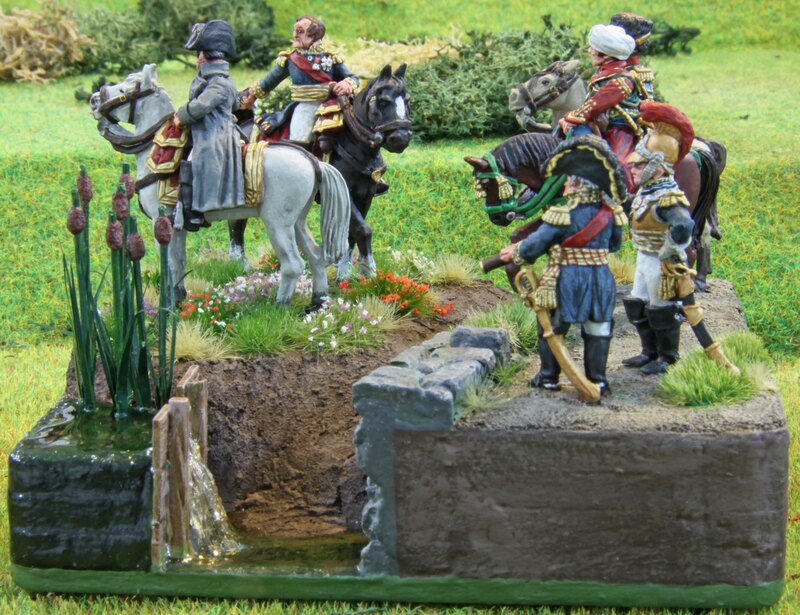 I shall start doing the landscaping for this base over the next couple of days and see if the minis actually fit into it and if they do I will need to decide if I shall need other minis to complete the diorama on it. So in the end I might end up painting more minis for this base after all. So now we are starting to reach the top brass for the Napoleon base or precisely Maréchal Nicolas Jean-de-Dieu Soult, the first Duke of Dalmatia. He was born on the 29th of March 1769 at Saint-Arnans-la-Bastide. He enjoyed a good education and wanted to become a lawyer like his father who was a notary, but had to enlist as a private in the French Infantry after his father’s death in 1785. His superior education ensured his promotion to the rank of Sergeant after six years service, and in July 1791 he became instructor to the first battalion of volunteers of the Bas-Rhin. He served with his battalion in 1792. By 1794 he was adjutant-general with the rank of Chef de Brigade. After the Battle of Fleurus in 1794, in which he greatly distinguished himself for coolness, he was promoted to General de Brigade. The next five years saw him employed in Germany. In 1799 he was promoted General de Division and ordered to proceed to Switzerland. He distinguished himself in Masséna’s great Swiss campaign, and especially at the Second Battle of Zürich. He accompanied Masséna to Genoa, and acted as his principal lieutenant throughout the protracted siege of that city, during which he operated with a detached force without the walls. After many successful actions he was wounded and taken prisoner at Monte Cretto on 13 April 1800. But the campaign had laid the foundations for his military fame. After the victory of Marengo restored his freedom he received the command of the southern part of the Kingdom of Naples, and in 1802 he was appointed one of the four Generals commanding the Consular Guard. During this time he showed great devotion towards Napoleon and in August 1803 was appointed to the command-in-chief of the camp of Boulogne. In May 1804 he was made one of the first Maréchals of the Empire. He commanded a Corps in the advance on Ulm, and at Austerlitz he led the decisive attack on the allied centre. As Corps Commander he participated in the Battle of Jena in 1806 and attacked Königsberg on the day of the Battle of Friedland. After the conclusion of the Peace of Tilsit, he returned to France and was created 1st Duke of Dalmatia in 1808. He was never entirely happy with this, since he felt entitled to the title of Duke of Austerlitz, which Napoleon had taken for himself. In 1809 Soult was appointed to the command of the II Corps of the army with which Napoleon intended to conquer Spain, and after winning the Battle of Gamonal he was detailed by the Emperor to pursue Sir John Moore’s British army. At the Battle of Corunna, in which the British general was killed, he was defeated and the British escaped by sea. For the next four years Soult remained in the Peninsular. In 1809, he invaded Portugal and took Oporto. Isolated he tried his best to consolidate what he had, most likely in hopes of being made King of Portugal. This never happened and only gained him the hatred of Republican officers in his army. 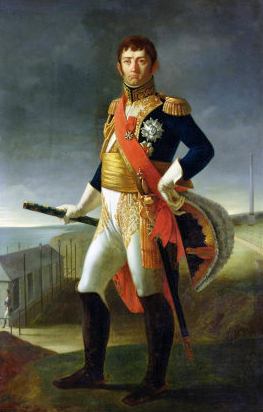 He was eventually driven from Portugal in the Second Battle of Porto and had to retreat over the mountains.. After the Battle of Talavera in 1809 he was made chief-of-staff of the French troops in Spain with extended powers, and on 19 November 1809, won a great victory at the Battle of Ocana. In 1810 he invaded Andalusia, which he speedily reduced. He ignored Cadiz to take Seville, but had to lay siege to the former, which proved a strategic disaster. In 1811 he marched north into Extremadura and took Badajoz. When the Anglo-Portuguese army laid siege to the city he marched to its rescue, and fought and nearly won the famous and very bloody Battle of Albuera on 16 May. After the British victory of Salamanca, he was forced to evacuate Andalusia. In the subsequent Siege of Burgos campaign, Soult was able to drive Wellington’s Anglo-Allied army back to Salamanca. There, Soult failed to attack despite superiority of numbers, and the British army was able to retired to the Portuguese frontier. After constant disagreements with King Joseph Bonaparte he was recalled from Spain. Some sources say at his own request, others at the request of King Joseph. In March 1813 he assumed the command of IV Corps of the Grande Armée and commanded the centre at Lützen and Bautzen. At Großgörschen he took over command of the Guard Infantry. Inspite all this or maybe even because of it, he was sent to the South of France to repair the damage done by the great defeat of Vitoria, which he did to good effect. His last offensives into Spain were turned back and he was maneuvered out of several positions at Nivelle, Nive, and Orthez, before the Battle of Toulouse, where he withdrew after giving the British greater losses than he got. Upon hearing of Napoleons abdication, he agreed on an armistice with Wellington. After Napoleons abdication he declared himself a royalist and became Governor of the 13. Division and later Minister of War. He took his leave when Napoleon returned to power and retired to a farm near Saint-Cloud. Only after the emperor had demanded his return did he declare for Napoleon and became his chief of staff during the campaign to follow. He even took over command when Napoleon left the Army at Laon. At the Second Restoration he was exiled and lived in Düsseldorf, Germany. But in 1819 he was recalled and in 1820 again made a Marshal of France. He once more tried to show himself a fervent Royalist and was made a peer in 1827. After the revolution of 1830 he made out that he was a partisan of Louis Philippe, who welcomed his support and revived for him the title of Marshal-General. He served as minister of war from 1830 to 1834, as Prime Minister from 1832 to 1834, as ambassador extraordinary to London for the coronation of Queen Victoria in 1838, again as Prime Minister from 1839 to 1840 and 1840 to 1847, and again as minister of war from 1840 to 1844. In 1848, when Louis Philippe was overthrown, the aged Marshal-General the Duc de Dalmatie again declared himself a republican. He died at his castle of Soultberg, near his birthplace. Now his uniform did not give me too many problems, since he was a Maréchal. I left the top of is bicorne without gold fringe since the Perry had not sculpted it and honestly, I never liked that anyway. Although he was already 46 at the time of Waterloo, I went for reddish brown hair, just like you see on most paintings. All Waterloo paintings I could find show him on a dark horse. 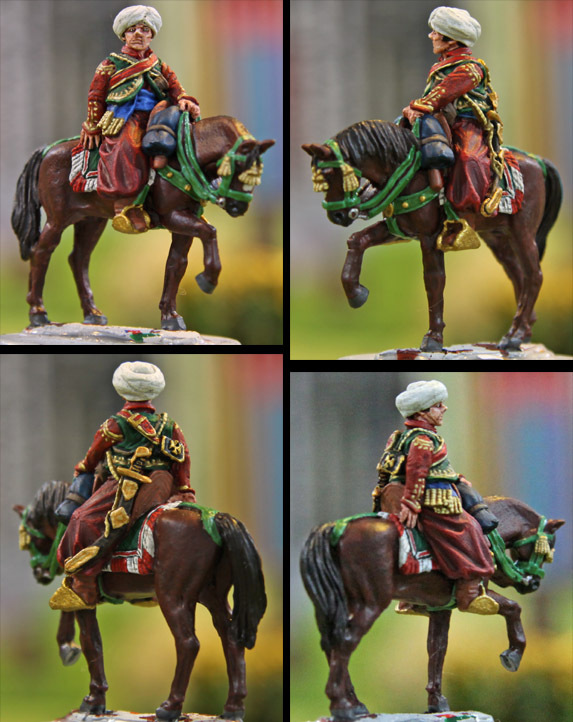 I was in no mood for a black one and did not want another chestnut since the Mameluke Ali is already riding one. So I went for a dark brown one. All in all I really enjoyed painting him. I really like the combination of the red shabraque with the dark blue and white uniform and the huge amounts of NMM gold. The weather meant that it was a bit slow going though. We had temperatures well into the 30´s°C with a humidity of less than 20%. So the paint would go dry almost instantly and the brush had to be cleaned after almost every stroke… no pleasure with all the fine detail that needed to be done. Oddly enough, when done I realised that the smallest brush I had used on this mini had been a size “0”. Up next is Napoleon Bonaparte himself. Not sure when he will be done though. Most of the next few days is booked out with non-painting stuff, so do not expect him before monday, unless I get to finish him today. Today is the turn of Mameluke Ali. The funny thing about him is that he was no Mameluke and that his name was not Ali. He was a Frenchman named Louis-Etienne Saint-Denis who was born on September 22nd, 1788 in Versailles.Originally he served on Napoleons household staff and became his second valet on the 11th of December 1811, taking on the name of the man he replaced, the Mameluke Ali. 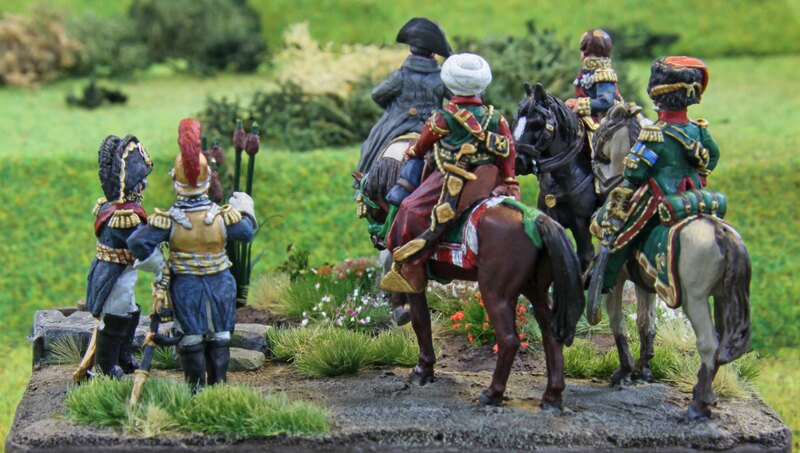 His first valet was a real Mameluke named Roustan who served Napoleon from August 1799 till his first abdication in 1814. When Napoleon contemplated taking his own life, Roustan left his service for fear of being made responsible for his death. When Napoleon returned to France and power in 1815, Roustan returned to him offering his services. Napoleon would not forget his perceived betrayal the previous year, refused and Ali became his first valet. He stayed at his side till Napoleons death and participated in the return of his ashes. The former Emperors last will left him with a sizeable sum and the mission to bring his library to the king of Rome, something he never fulfilled. After Napoleons death he took on a job in a riding school in Paris. He was decorated with the Legion of Honor on February 23, 1854 and died May 3rd, 1856 in Sens. And here is the mini itself. His dress gave me some trouble. The picture above is the only one I could find of him. So in the end I picked a Mameluke dress I liked and painted him that way. Same goes for his horse, so I simply picked a chestnut, since I felt it would compliment the other colours quiet well. I chose leather dyed green for the bridles and so on. 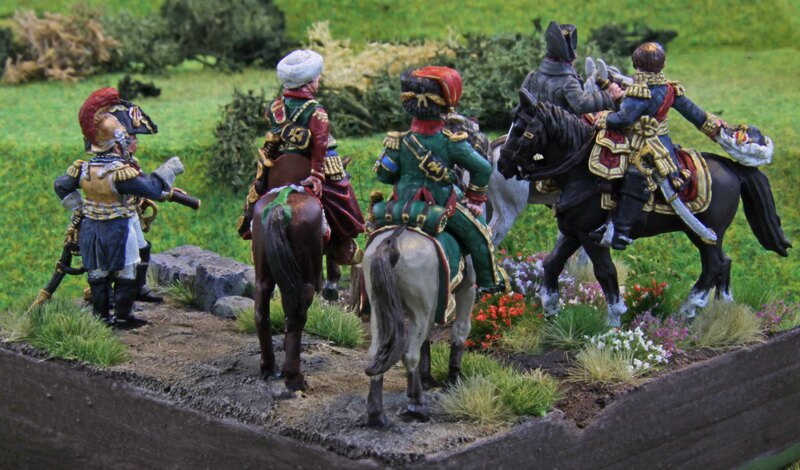 This was not uncommon with the Mamelukes and I felt this would add a little colour to the base. I had a minor issue with this mini though. There was a slight mould misalignment. Most of this could be scraped off, but it shows somewhat on his face. As nice as the Perry poses are, you have a fair chance of a defect like that and I really hate this, especially with character minis. Right now Maréchal Soult is on my table and you will see him tomorrow.